With a million threads to bury on that beast of a quilt I pulled out these needles. They were part of some swag in the Denyse Schmidt Improv class from QuiltCon and they originally come from Purl Soho. I put them aside after trying them for binding. (Not a good use there - it cut the thread sometimes and was thick for getting through the small edge of the binding.) But I find them absolutely perfect for burying threads. I must admit, I never used to bury my threads. I just stitched once or twice where I started then cut flush. Frankly, I was lazy. But the finished look was nowhere near as neat. So now I spend the evening burying threads and am much happier with the finished results. I do tend to wait until I'm done all the quilting so it can add up to a fair amount of work, but I find it easier and it doesn't break with my machine quilting rhythm. I do exactly the same technique as Amanda. And these easy thread needles are perfect for it. They save you trying to thread two threads into the eye of the needle, and having sit awkwardly in order to use your eye, at eye height, to thread what are likely to be short threads attached to a heavy quilt. Oh, and in case you were wondering about the intensity of that quilting, here is my thread. Can you see it? That's 1000 meters of thread per spool! I used one whole spool and then some. Need to get me some.... Really dislike burying threads. This is the solution!!! I bury threads too but never thought to use those needles. So clever! Thanks, Cheryl. I have always wondered about this. The technique you link to is great! Where do I find that cool thread needle/pen? Your quilting is absolutely exquisite by the way. I love your creativity. 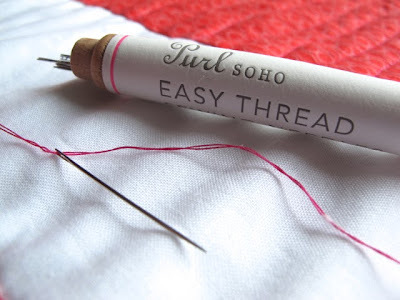 I'll have to give Purl Soho's needles a try. I always use self-threading needles for burying ends, but the ones they sell at the big box stores are not very good. Thanks for the tip! Hi Cheryl! Do you know if your needles are made by Clover? I have some Clover ones, but I don't really like them. The thread breaks as often as it gets into the eye when I'm "self-threading" them. Great idea, but they don't work that well, so I'd love to try another brand if there is one out there! I live on self threading needles. My eyes thank me. Depending on the thread (especially cotton) they do break more easily/shred when trying to snap them into the hole. Also, the actual self threader wears away eventually and you need a new one. 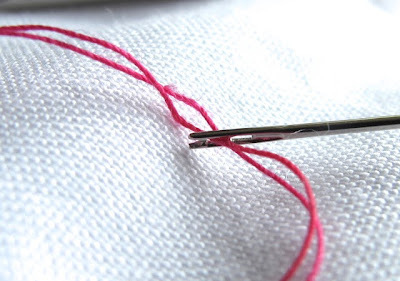 I have found a tip for those threads that are too short to bury with a needle - use a piece of thread in the needle as a lasso - and lasso the teeny thread that needs to be buried. works wonders for occasional pokeys too. ;-) Have tried a few brands and they all seem about the same to me? I use side loading needles for those really awkward short threads. 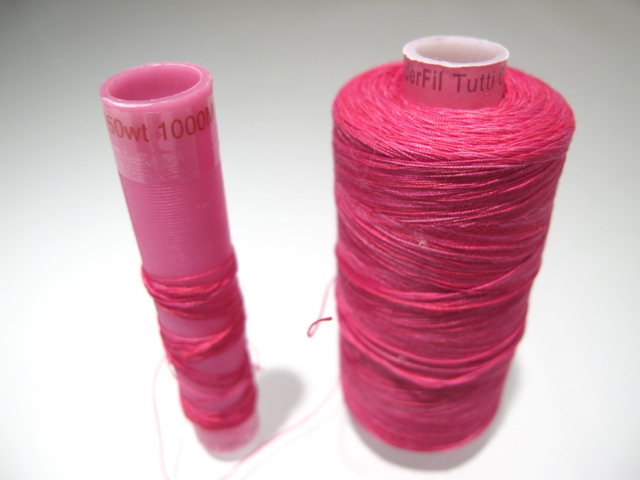 If you need to, you can put the needle into the quilt and then get a wrap of thread round it. The side loader then sort of grabs it as you pull the needle into the quilt the rest of the way. Hope that makes sense!